So, this was the lecture title I was given for the RCEM CPD conference this year for the geriatric medicine session. Quite the opposite of what I usually talk about, which is thrombosis and why we should anticoagulate everyone. Having said that there is no denying the link between bleeding and clotting. We set up our local thrombosis committee as a ‘thrombosis and anticoagulation committee’ for example, realising that it would be futile to try and tackle just one half of this issue. FOAM also gets this, evidenced by the recently launched ‘blood and clots’ series from Canada1. As my friend and colleague Kerstin de Wit always says, ‘clotters bleed and bleeders clot’. How we manage the 2 competing pathologies is sometimes very tricky. Sometimes we go external and consider these tricky decisions to be the remit of a haematologist with an interest in thrombosis and haemostasis. If you are in Canada or the states with thrombosis specialists, they live for this stuff. But often you will be faced with challenging decisions about care out of hours, or with limited specialty expertise. And let’s remember, you are always the one in front of the patient. Who can highlight the risks and benefits of different treatments? Who understands the pragmatics of delivery regarding complex antidotes? Who understands the issues around transfusion, surgical intervention, complex blood testing etc.? 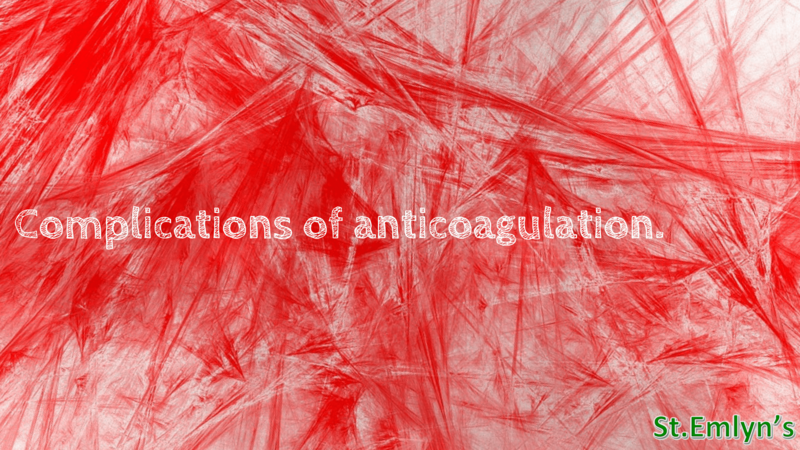 The complications of anticoagulation are an issue for emergency medicine and there is no denying it. So, let’s talk about scale – how big is this problem? When I am banging on about thrombosis I usually refer to the worldthrombosisday.org stats and talk about VTE as responsible for more deaths than many other pathologies combined, half a million european deaths every year etc… Bleeding data is a little trickier to come by reliably – but there are some good recent estimates of annual bleeding risk for patients on anticoagulation. For intracranial haemorrhage, this comes out as usually about 0.5 to 0.9% ICH risk/100 patient years. Major bleeding is more like 2-3% risk, with an associated case fatality rate of 9.1%4. There are definitions of clinically relevant non major bleeding, minor bleeding that we could go through but these tend to be of far higher incidence as a rule. Let’s think about this room, or any room at your last conference. Probably about 500 people. Let’s say we were all started on anticoagulation today. This means that over the next year somewhere between 3-5 of us will have an ICH. 13-15 of us will have a major bleed. 1 to 2 of those people will die and several others will be left permanently disabled. This obviously depends a little on individual risk. In the first 3 months following diagnosis of VTE, all these numbers are higher. If you have additional risk factors for bleeding, all these numbers are higher. Bleeding risk factors are not always the ones you think they are – have a look at the ACCP guidelines, articles on the topic5 or the HASBLED score6 for an example of some of the things that appear to put you at higher risk. How many people in the UK are anti coagulated at any one time? probably about 1% of the over 20’s if you believe European registry data 7. There were 66 million in the UK 2017 population – this makes at least 660,000 anticoagulated patients, with the event rates as above. This stuff needs careful individualised assessment and thought when balancing risk. Wow that’s bad – and presumably the DOACS have made it all even worse? Worth noting when we talk about scale that there are differences between the DOACs and warfarin here, which are perhaps not in the direction you might think. Firstly, rates of ICH in both SR/MA of trials and in practical shop floor registries are pretty much halved 8 when you compare NOACS to warfarin. They are still more than antiplatelet patients, but not by much.The all cause mortality in DOAC use is also lower compared to warfarin 8. They do however seem to have higher rates of GI bleeding and menorrhagia than warfarin 9 . This perhaps reflects priorities when it comes to management which we will discuss later. Overall though, we are starting to get more imformation through on these drugs, and they are not as nasty as you might think. More importantly, this data all comes from a time prior to any antidotes for DOACs but when there was one available for warfarin. This starts us thinking that perhaps resuscitation and supportive care are more important than any one magic bullet. What can I do about bleeding on anticoagulation? Sounds easy when written down. Maybe not so much in practice, but still needs to be considered as a vital first step. Of course stopping the drug should be commonsense, but stopping the bleeding can sometimes get people tied in knots. If bleeding is at a compressible site, or one amendable to immediate surgical intervention, then this process needs to be commenced immediately. If it is non compressible, such as GI bleeding or Menorrhagia, then don’t underestimate the vital importance of involving specialty expertise early. You can spend all afternoon sourcing the most expensive antidote around, but if the patient has a bleeding peptic ulcer there is no guarantee that reversal wil stop the haemorrhage. An endoscopy probably will. This talks to the earlier issue of variable outcome dependent on anticoagulation agent. We have unfortunately seen GI bleed patients locally who happen to be taking rivaroxaban languish while lots of complex phone calls take place about reversal agents. One of the key aspects to consider initially is how you can stop the bleeding physically, and where your patient needs to be for that to happen. Moving these people to an area where there will be a heightened sense of urgency and intervention also reinforces the time sensitive issue of bleeding (that delays in treatment often lead to coagulopathy, which leads to more bleeding). Again most of this stuff should be commensense to an emergency physician. Haemostatic resuscitation. Avoidance of crystalloid. Early venous blood gas analysis to get an idea of metabolic shock. Point of care INR. Expert help if required. Tier 1 neuroprotection in ICH with decreasing GCS. Baseline bloods are important, but probably the most useful bit of information you will get from them is the creatinine clearance – don’t be fooled into thinking that a thrombin time is going to tell you what to do in the first hour. Manage these patients clinically, as you would a patient who was bleeding without anticoagulation. For warfarin – we like to think we have this nailed. A decent dose of Prothrombin Complex Concentrate at 25-50IU/Kg, with additional 10mg IV Vitamin K for at least 3 days should offer fairly reliable and rapid complete reversal. Interestingly though, the data would suggest that for all our confidence we are not actually great at this. Even if you use a helicopter to fly the PCC to the roadside as a recent study has done 10, it seems to take a median 3 hours (IQR 152 to 254 minutes) to get the INR below 1.5. This needs thinking about. What’s the average time in your institution? What are the barriers to administration? Where is the PCC kept? Who draws it up? How is it administered? And how can you provide clear, easy decision support and make it easy for people to do the right thing first time round? If we do want to act, we often consider PCC as the generic antidote for these drugs. But while this appears to work in healthy volunteers taking DOAC agents, we remain unsure of efficacy in the management of serious clinical bleeding. A recent observational cohort study 13 suggested it was effective in less than a third of patients with DOAC related ICH for example. And there are huge opportunity and financial costs here. What are you not doing, while you’re on the phone gaining approval from a consultant haematologist, then prescribing this drug, then drawing it up, then filling in the DATIX about how difficult the whole process is. Again, think hard on this and I tend to only reach for it in extreme circumstances such as major bleeding in the patient who took their dose 2 hours earlier. Despite the limitations in evidence, most local and some national guidelines will continue to recommend consideration of PCC until we have other agents on our shelves. Additional haemostatic measures? All gold. Most patients with serious bleeding of any type should now get tranexamic acid routinely and all the additional measures in the major haemorrhage pathway such as temperature control, warmed blood products, calcium supplementation and cell salvage if applicable. Don’t ignore them, and don’t forget to give or do them while you pontificate on the merits of giving fancy reversal agents. The last thing to address on antidotes is probably the question of whether giving platelets is reasonable, to those patients unlucky enough to have a major bleed on clopidogrel, ticagrelor or any other new antiplatelet agent. Although the rationale is understandable here, the evidence at present suggests against their use. In the PATCH study 14, randomised transfusion of platelets in patients with spontaneous ICH on antiplatelet therapy doubled the odds of death or dependence, increased serious adverse events and added an additional 7% to a baseline in-hospital mortality of 17%. This generates a number needed to harm of 14. Not for me thanks. There may be rare occasions where overall you think it best, but certainly in ICH it appears to come with harm and we need to be mindful of that. 4 – What measures can we use to guide our resuscitation? I’m not sure I use any special ones. By the time you get any unusual measurements back, key decisions should have already been made and urgent treatments provided. Are there clever lab tests that can be done? Definitely. Do we use them routinely and understand interpretation? No. So I wouldn’t start in a difficult clinical situation. There is a potential future role here for thromboelastography. The TEG 6s system with platelet mapping assay is no doubt already being used by some and can offer valuable real-time insight into degrees of platelet inhibition and function. This system is also developing a DOAC cartridge which may well add objective weight to the clinical pharmacokinetic assessment referred to above. Might be something you want to look at. Certainly, our TEG assays have helped us recently, but interestingly more in the manner of supporting us to cause haemorrhage; our neurosurgical patients on clopidogrel who are denied interventions for perceived risk of bleeding can now have a TEG demonstrating reasonable platelet function after a few days cessation, and the surgeons can be encouraged to get on with it rather than waiting for 2 weeks. All of these are rare. The best known appears to be heparin induced thrombocytopenia (HIT), which we worry about unduly when prescribing initial VTE prophylaxis or treatment most often. The incidence is around 0.5%, and the onset typically 5-10 days after starting heparin, although it can be earlier or later. The platelet count will fall by 50% on average and usually get to a nadir in the 50’s. Also, 50% of these patients will develop thrombosis – HIT is a prothrombotic disorder, and should be managed as such not with transfusions and cessation but switching to alternate methods of anticoagulation. What are the recommendations around diagnosis? Well, anyone started on heparin of any form should have a baseline platelet count according to the British Committee for Standards in Haematology. After this, the incidence is so low that routine monitoring is no longer recommended. Clinical suspicion (of thrombosis, skin lesions or easy bruising) should prompt formal consideration, repeat blood testing and calculation of the pretest clinical probability 4T score, which is easily available on medcalc. A low score and you can exclude the possibility. A high score necessitates laboratory testing using by sending platelet activation assays to a central laboratory – during this time, heparin should should be stopped and replaced by an alternative method of anticoagulation. Danaparoid, fondaparinux or argatroban will all do the job here. As may some DOACs, depending on the indication. DOAC induced liver injury (DILI) is perhaps the next ADR of interest. A recent study from Italy 15 pulled together all reported adverse drug reactions including DOACS from over 110 countries up to 2014 and went through a painstaking 32, 974 reports. Most covered bleeding, but there were significant associations reported between hepatic failure and rivaroxaban/ dabigatran. Other authors have questioned 16 whether this is any higher an incidence than with other general drugs, and highlight that drug induced liver injury is often seen but poorly understood. Either way something to be aware of and vigilant about. The other notable theme from the Italian study was of potential correlations between DOAC use and musculoskeletal issues, including arthralgia, joint swelling, myalgia and muscular weakness. I hadn’t heard of this before and found it interesting. What’s the answer to all these problems – probably a sit down with the patient, a look at what the indication is for anticoagulation and a frank discussion about the potential to change agent or cease altogether. Failure – what do we mean by this? Usually, this is taken to mean a new thrombosis, recurrence or extension on anticoagulation. Again, this is rare. We worry about it as we tend to think that clotters clot. But often they don’t clot. They bleed. And so we need to be really careful about the idea of escalating anticoagulant therapy unless we are clear that we have proven recurrence in spite of effective anticoagulation. This needs to involve a discussion around compliance, site administration, diet, dosing etc… Personally, I do not change therapy until I have hard proof of extension or recurrent VTE through imaging, as I think this diagnosis has huge implications regarding lifelong anticoagulation. We also need to bare in mind the challenges with diagnostics here. We know that CT can overreport small insignificant thrombi. We know ultrasound has a degree of subjectivity regarding operator interpretation. In fact, departmental ultrasound only really has validity for qualifying extension when there is a difference in clot size of approximately 9cm or more 17. Therefore a diagnosis of failure needs to be made following a pretty convincing report, and taken in context of all previous reports and documented pathology. Drug interactions – these are a pain. There are loads with warfarin as we know, and there is no easy way of remembering all these other than to remember to check the SmPC, the BNF or your local guidance when prescribing. Heparins have relatively few interactions, but people often forget that the LMWH agents are of porcine origin and this information should be provided to all patients receiving treatment. Also worth mentioning here that you can get hypersensitivity reactions to heparins (including urticaria, Angioedema and anaphylaxis) and that also heparins inhibit aldosterone secretion. As such, these drugs can cause a hyperkalaemia, which occurs more often in those susceptible to renal injury in general, through diabetes, chronic kidney disease or those on potassium sparing diuretics. What about renal function? Well the short story, is that very few things are licensed other than IV heparin for patients with an eGFR of <15mls. Our renal unit has fairly extensive experience with certain types of LMWH, and for prophylaxis we are happy usually to use a low dosing strategy for patients with an eGFR between 5 and 15mls/min without routine monitoring. But if there are doubts, you are prescribing treatment dose or you want to be absolutely sure, then the only way is to perform regular trough levels predose to ensure adequate clearance. Some guidelines will tell you if the eGFR is <30mls/min you can only anticoagulate with admission and intravenous heparin. This is impratical, especially in this day and age of crowding, so speak to your pharmacists about a work around and bear in mind this is all risk benefit – sometimes it is undoubtedly less risky to omit prophylaxis, than it is to start an IV heparin infusion for a flimsy indication. You must be running out of things to say by now…. Yes, I think that’s true. So that’s it for the complications of anticoagulation. I am sure there are others, but hopefully we have covered most of the important ones. Lots to think about as always. I hope the take home is that simple haemorrhage management rather than expensive antidotes can save lives, and that we perhaps need to worry a little less than we currently do about the rarer adverse drug reactions and interactions. Remember also that you can have a big effect on the management of these patients in your departments by ensuring that complex pathways are made simple and rapidly deliverable by your out of hours junior staff. Want more? Have a look at the Candaiem.org #bloodandclots series, the BCSH guidelines and think about how you could improve things where you are. Anticoagulation is not going away. Your patients will thank you for getting properly to grips with it. Shih A. Blood and Clots Series: What are the risks of reversing DOAC-associated intracranial bleeding? – CanadiEM. CanadiEM. https://canadiem.org/blood-clots-series-risks-reversing-doac-associated-intracranial-bleeding/. Published February 27, 2018. Accessed April 15, 2018. 10 Funny Pie Charts. Qwerty98311’s Weblog. https://qwerty98311.wordpress.com/2010/02/17/10-funny-pie-charts/. Published February 17, 2010. Accessed April 15, 2018. HASBLED score. MedCalc. https://www.mdcalc.com/has-bled-score-major-bleeding-risk. Published 2018. Accessed April 15, 2018.